← Rail: do we have the vision to make it work? For a month or so this southern summer I’ve been a resident of Antarctica. Not just any old Australian station, but Douglas Mawson’s “home of the blizzard”, Cape Denison, where nearly a century ago he established the headquarters of his Australasian Antarctic Expedition. Antarctica's vast ice plateau looms behind Douglas Mawson's 1912 expedition headquarters. As one of eight members of the 2008-09 Mawson’s Huts Foundation conservation team, I had the job of writing about the group’s heritage conservation work in the windiest place on the planet, where the weather finds its way into every conversation. We had a balmy summer for the most part, but the katabatic wind here is typically something truly ferocious. Hurtling down the ice plateau’s outer slope, it reaches maximum force when it hits the coast, making life difficult for any inhabitant, but especially so for ill-adapted humans. Like the wind, the Antarctic ice plateau looms large at Cape Denison. It starts a stone’s throw from Mawson’s famous huts and continues for thousands of kilometres until it reaches the coast on the other side of the continent, at an average depth of more than two kilometres. Including its immense load of ice – 90 per cent of all the ice on the planet – this continent is nearly double the size of Australia. If all of this ice sheet melted, seas around the world would rise by about 60 metres. Antarctica is not melting – at least, most of it isn’t. Whatever sea level increase rise happens this century will probably come mostly from expansion due to ocean warming and loss from the Greenland ice sheet and mountain glaciers. But the ice continent remains a gigantic question mark. Antarctica is really two separate places: East Antarctica, the larger part of the continent to the south of Australia and Africa, and the smaller West Antarctica, south of South America. West Antarctica is actually an archipelago of rocky islands joined together by an ice sheet, which is in direct contact with sea water along most of its edge. If this sea is warming (which evidence says it is) then the ice sheet’s base will tend to melt, starting at the coast. Such melting is already adding water to the oceans and is likely to be a major contributor by the century’s end. East Antarctica is another story. Some of its ice is below sea level, but most of it rests on a rocky continental shield and is unaffected by sea. Until recently the conventional scientific wisdom has been that despite global warming the East Antarctic ice sheet is actually increasing in size. But there’s now evidence that some East Antarctic glaciers – like others elsewhere on the planet – are thinning. And new discoveries of extensive areas of liquid water in rocky basins underneath the ice sheet have thrown some common assumptions into question. The ice sheet is not, as we once thought, everywhere frozen to the bedrock below, but is potentially quite mobile. We lack the data to say exactly how this will affect climate or sea level, but starting this year, an international survey operating out of Australia’s Casey and the US McMurdo stations will try to fill some gaps, using ice-penetrating radar from aircraft to gather data on current and past ice flow and the underlying rock structures of a large part of East Antarctica. Changes to the East Antarctic ice sheet are measured in centuries and even millennia. Ice loss will vary in different parts of the continent and will mostly be very gradual, but studies of the way ice sheets decay tell us that sometimes the changes will be rapid and unpredictable. We get pretty much the same in miniature here at Cape Denison. A balmy day with a steady thaw, then a cold snap freezing drips into icicles, then a sudden breach and flowing water. In the end, we humans have no control over nature. All we can do is respect it – and that seems to be the hard part. 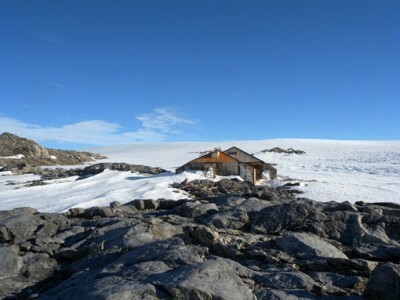 My stay at Cape Denison was made possible by the Mawson’s Huts Foundation and the Australian Antarctic Division. This entry was posted in Antarctic, community action, glaciology, ice, science, sea level and tagged Antarctic, Antarctica, Australia, Cape Denison, Casey, climate change, community action, Douglas Mawson, East Antarctica, glaciology, global warming, ice, Mawson's Huts Foundation, McMurdo, Peter Boyer, science, sea level, Tasmania, West Antarctica. Bookmark the permalink.